Redlands, California—Esri, the global leader in spatial analytics, awarded Microsoft Corporation, with the New Technology Integration Award at the Esri Partner Conference in Palm Springs. This award honors a company in Esri’s Partner Network for taking map visualization and location analytics to the next level by integrating ArcGIS in a new or innovative way. 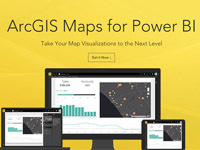 Microsoft was recognized for integrating Esri’s ArcGIS Maps into Microsoft Power BI, a set of business analytics tools. Power BI allows users to share insights in the form of interactive maps layered with authoritative data, all in one seamless process. Individuals can access valuable geographic information in order to make better business decisions more efficiently without having to export data from numerous sources online. Power BI enables users to create dashboards, reports, and visualizations of data through a cloud-based service. This allows anyone in an organization to use Power BI’s powerful analytical capabilities anywhere, and access them via an application that can be downloaded to mobile devices. For instance, a retailer surveying a new location can use ArcGIS Maps within the Power BI mobile app from the field to determine its proximity to potential affluent consumers. "Esri and Microsoft's collaboration to integrate ArcGIS and Microsoft Power BI is a huge step forward in the BI space,” said Chan Lee, strategy and analytics, Chick-fil-A, Inc. “It will give retailers the ability to leverage a robust set of analytical and geo-enabled visualization tools that we've not seen from any other solution available. Now that the ArcGIS Maps for Power BI preview has been announced it is definitely something that we'd like to evaluate for the future." Armed with what Esri calls The Science of WhereTM, a transformational way to unlock data’s full potential, Power BI users can create informed location-based analyses for everything from allocating resources to the best places to start a new business. Learn more about the collaboration between Esri and Microsoft.